Last month I went to the Azores with João for a much-needed vacation. 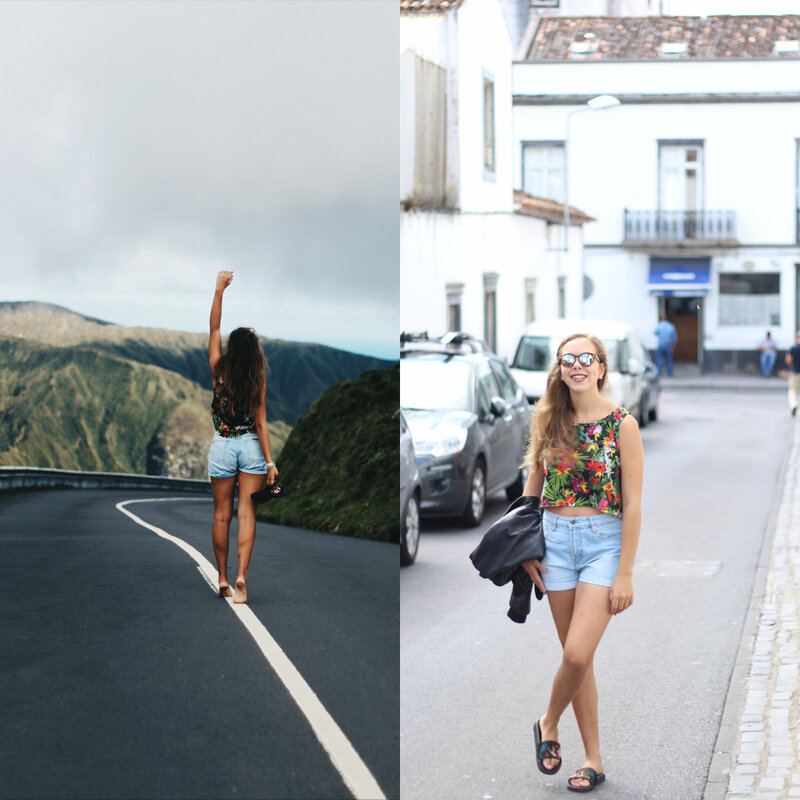 We stayed in the lovely island of São Miguel for a week and I might do a travel guide to the Azores later, but for this post, I decided to share with you three of the outfits I wore while I was there. I hope you like it. 2. Go for versatile pieces that you can either use for a day visiting and walking around the city or for a night out. For my first day there I spent the day walking around Ponta Delgada and visited Lagoa do Fogo. I needed an outfit that was not only very comfortable but also that I could wear with a bikini underneath. For that, I went for a pair of super simple jean shorts and a cute floral cropped top from Origama. I added my super comfortable sandals from Primark and a pair of sunglasses. Also in the Azores, the weather is very inconsistent so I would always carry a jacket with me. The one I chose to take was a fake leather bomber jacket from Zara. This outfit is super comfortable and very summer time and vacations appropriate. I love it. Besides that, I think this is the kind of look that suits with the island perfectly due to is nature theme and green tones. This outfit was another easy choice. I love to take dresses on vacation with me in the summertime, they don't take up a lot of space in my luggage and they always make me feel good and look put together. I decided to pack along this beautiful green dress because it's an easy piece to either dress up or dress down and it will fit perfectly in any occasion. For shoes, I picked the most comfortable pair of shoes I owned a pair of sandals that I got one year ago from Aldo that I absolutely love. To accessorize the look I went for my Cheapo sunglasses and my Nixon watch. As a coat, I went for my Zara bomber once again. Last but not least I'm gonna talk you through one of the last outfits I wore. This outfit is something that I like to call my daily uniform. I tend to go for this kind of look more or less on the daily basses and taking these pieces with me was an absolute no-brainer. I paired a simple white t-shirt from Zara and a pair of mum jeans that are plain and simple. My pair of Toms were my shoe of choice and I couldn't be happier about that. I love how comfortable they are which is my number one essential characteristic when it comes to picking a pair of shoes to pack when going on vacation. Once again I went for my Zara bomber and my Nixon watch, for this outfit I stole my boyfriends Ray-Bans because they fit really nicely with this outfit. I really hope you liked this post. É um sitio fantástico, esta foi a segunda vez que lá fui e já sei quando vou voltar! Vale muito a pena! Que fotos lindas ! Adorei todos os outfits! Os açores devem ser o sitio mais insta frendly onde já estive! É sem dúvida uma viagem que vale muito a pena mesmo!